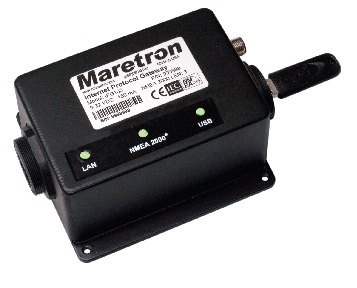 The Internet Protocol Gateway (IPG100) lets you connect Maretron black boxes (MBB100's), Maretron touch screens (DSM800's), PC?s, Mac?s, tablets, or smartphones to an NMEA 2000® network so you can monitor and control your vessel using Maretron?s N2KView® software. The conventional way of viewing NMEA 2000® information is with a display on the vessel that is directly connected to an NMEA 2000® network, but with the IPG100, you are not limited to direct connected displays. With the IPG100, you can use any device running N2KView® software to monitor and control your vessel from onboard or ashore. Please note that the IPG100 requires an N2KView® hardware license key (dongle) with serial number 500 or higher. Older serial number dongles (1-499) will not work with the IPG100. If you already use N2KView® with a USB100 and PC but wish to upgrade to an IPG100, please contact Maretron sales to exchange your old dongle (serial number 1-499) for a new dongle (serial number 500 and up).